Aksharadhool: What's in a name? There is a famous quote from William Shakespeare's Romeo and Juliet (Act 2, scene 2), that says: "What's in a name? that which we call a rose: By any other name would smell as sweet". Part of this sentence was first used by the author Isaac Asimov to name a short story written in 1956. I do not know whatever Shakespeare wanted to convey in his famous quote, but history proves that many a times, a name has proved to be everything, be it of a person, organization or even a place. The daughter of India's first prime minister, Jawaharlal Nehru, Indira, married in 1942, a young gentleman born Feroze Jehangir Gandhy to a Parsi family in Mumbai. His parents, Jehangir Faredoon Gandhy and Ratimai (formerly Ratimai Commissariat), lived in Mumbai but had migrated to Mumbai from Bharuch in South Gujarat, where their ancestral home, which belonged to his grandfather, still exists in Kotpariwad. Feroze was the youngest of the five children with two brothers Dorab Gandhy and Faridun Jehangir Gandhy, and two sisters, Tehmina Kershashp Gandhy and Aloo Gandhy. 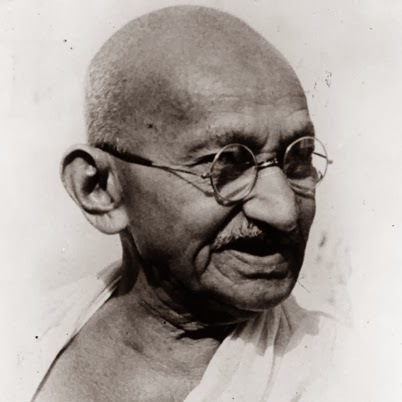 The point I am trying to make here is that Feroze Gandhy's family surname was distinctly different from that of Mahatma Gandhi (Which is a common Gujarathi Surname.) However down the line, somewhere and at some point of time, the Gandhy's changed their surname to Gandhi's. There is no point in elaborating the reasons for this change, because they are too obvious. I have mentioned this, just to augment support to my contention that sometimes name is everything. An imposing 12 feet high statue of famous Briton, Winston Churchill now stands on the central green of Parliament Square in London, overlooking the houses of parliament. He was such a famous man that hundreds of his portraits and statues must be adorning many places in Britain. Yet this very statue is always remembered, when we talk about the man. Reason is pretty simple. It is the place that lends the aura, befitting the greatness of the man himself. On September 11th, 2001, when Al Quaeda terrorists hijacked airliners in US to hit on specific targets, they selected the targets very carefully. They could have selected any of the other targets, which were perhaps not defended at all and which could have caused substantially greater loss to US. Yet they chose World Trade center in New York, Pentagon in Washington DC and third target that was selected was White house itself. With this selection of places, they wanted to challenge US supremacy in commerce, defence and finally world politics, and the targets were almost synonymous with that. Such is the power of the name. If there is a place in China that is synonymous with the country itself, it is the Tiananmen Square in Beijing. It was here that Chairman Mao, standing on the rostrum above the front entrance to the Forbidden City, On 1 October 1949, proudly declared the founding of the People's Republic to a packed and excited audience in the square. For the Chinese, Tiananmen Square is like Mecca, the holiest place on Earth. This square however became world famous largely due to a single event in 1989. On 4th of June that year, the Chinese government sent in soldiers and tanks to crush a student-led pro-democracy protest there. It ended with many people killed and injured. 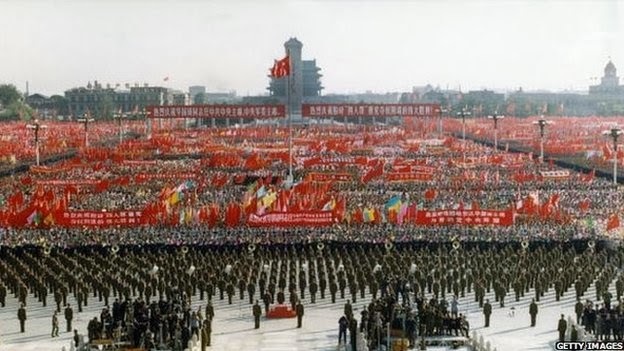 Tiananmen Square used to be an open ground and freely accessible from all sides. On hot and humid summer evenings, Beijing residents would come and sit on the ground in the square to cool down and many would fly kites in the square. After 1989, the square has been turned into something like a fortress. Iron railings have been erected around it and access has been restricted to four underground tunnels at its four corners. Security checks are in place to stop any potential trouble-makers from entering. Closed-circuit TV cameras are installed in many places for the authorities and police to monitor the square 24/7. 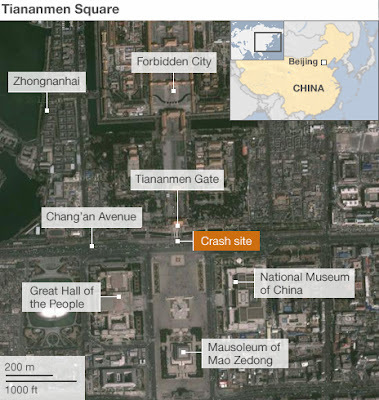 On Monday, 28th of October 2013 a white SUV or Jeep like vehicle crashed into a bridge in front of the Forbidden City in the Tiananmen square. The vehicle then crashed in a crowd and burst into flames. Two bystanders died on spot and 38 people were injured. Police say that the vehicle had a container for petrol, two knives and what they describe as a flag with extremist religious slogans on it. They added that the car's number plates were registered in Xinjiang province. According to the police, the crash was not an accident but a terrorist attack by Uighur extremists from the Xinjiang region and have started a man hunt for suspects. It is still not known for sure,whether it was an accident or a desperate attempt to make some sort of political statement. If it was really a terrorist attack, it was a very minor one considering extensive damages such attacks have caused in other parts of the world. However the crash has touched a raw nerve in China just because the place, where it has happened was none other but Tiananmen square itself. Suppose this would have happened in some other city, say Shanghai or Xian, it would have been probably treated as a minor incident and treated by police accordingly. Just because it happened in Tiananmen square, it has been publicized on national and International media. Do you see, what I mean? The name of the place is everything.